Flight cancelled or delayed? Denied boarding? Damaged, delayed or lost luggage? What are your rights? Do you have the right to compensation? When does the European air passenger protection apply? Does a carrier have to inform me about the extent of my rights? Who can I contact when I think that the carrier breached his obligations and I want to lodge a complaint? Can the ECC help me? What are my rights when the flight to which my reservation was confirmed is cancelled? What care is the carrier obliged to provide to passengers whose flight was cancelled? Under what circumstances am I entitled to financial compensation? Can the carrier avoid the obligations to pay financial compensation? What amount of compensation am I eligible for? What rights do I have when the flight was delayed? How long does the flight have to be delayed so that I am entitled to care from the carrier? What care is the carrier obliged to provide to passengers when significant flight delay is expected? Can the carrier avoid the obligation to provide care when the delay is caused by if the flight cancellation was caused by extraordinary circumstances which could not have been avoided even if all reasonable measures had been taken, for example weather condition, strikes etc.? Can I cancel my journey in case of significant delay? Does the carrier have to reimburse the amount paid for the flight ticket? Do I have the right to financial compensation in case of significant flight delay even if I decide to take the flight despite it as delayed? What does “denied boarding” mean? What are my rights when the carrier denies me boarding the flight which I have a valid ticket for? What amount of financial compensation am I eligible for? When I am denied boarding, do I have the right to both re-routing and reimbursement of flight ticket? Do I have the right to compensation when I sign up as a volunteer in case that the airplane is overcrowded? Regulation 261/2004 always applies when you depart from any airport located in the EU State Members, Norway, Iceland, and Switzerland. When you depart from an airport on the territory of a different state, the European law protects you in case that the flight is operated by a carrier who holds an operating license issued by an EU Member State. In case that the carrier cancels the flight or expects a delay of more than 2 hours or denies boarding to a passenger, it is obliged to provide the affected passengers with a written notice containing information about their rights. Each Member State is obliged to designate an appropriate body to enforce Regulation No 261/2004 on its territory. A list of these bodies is available here. Competencies of the supervisory authorities differ in every country. These authorities are not always competent to make decisions in particular disputes between carriers and passengers. Usually, the authorities have the right to apply financial sanctions in case of detected violations. 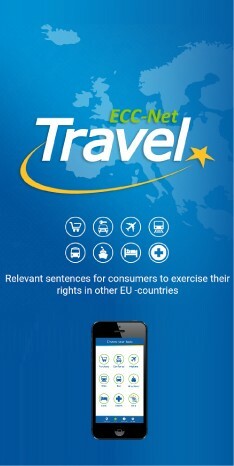 The European Consumer Centre can provide you with general information about your rights and it can also help find an amicable solution of an existing dispute with a particular carrier. When the flight is cancelled, the airline must provide you with re-routing and necessary care (for more information about re-routing and care see below). If you do not agree with the re-routing provided, you have the right for refund of the amount paid for your ticket. You have the right for financial compensation in specific cases. Re-routing means provision of alternative transport under comparable transport conditions at the earliest opportunity or on a later date if agreed so. Operating air carrier is obliged to provide refreshments in a reasonable relation to the waiting time. In cases where overnight stay becomes necessary, the carrier is obliged to provide accommodation and transportation to and from the place of accommodation (hotel or other). The carrier is also obliged to offer two free of charge telephone calls as well as fax messages or e-mails. Were informed of the cancellation less than seven days before the scheduled time of departure and the carrier did not offer re-routing, allowing them to depart no more than one hour before the scheduled time of departure and to reach their final destination less than two hours after the scheduled time of arrival. Yes. The carrier is not obliged to provide financial compensation if the flight cancellation was caused by extraordinary circumstances which could not have been avoided even if all reasonable measures had been taken. These circumstances are usually as follows: bad weather, strikes, air traffic control restrictions, actions of state authorities etc. Conversely, technical problems usually are not considered extraordinary circumstances. Operating carrier is obliged to provide refreshments in a reasonable relation to the waiting time. In cases where overnight stay becomes necessary, the carrier is obliged to provide accommodation and transportation to and from the place of accommodation (hotel or other). The carrier is also obliged to offer two free of charge telephone calls as well as fax messages or e-mails. You can cancel the journey without sanction when the expected delay is at least 5 hours. In this case, the carrier is obliged to reimburse the amount paid for the flight ticket. This applies also to passengers who booked their tickets that cannot be returned or changed due to tariff conditions. If you choose reimbursement, you automatically lose the right to free care from the carrier. The ruling of the Court of Justice of the European Union says that you have the right to compensation similarly as in case of flight cancellation, when you reach your final destination three hours or more after the scheduled time of arrival. The amount of financial compensation is the same as in case of flight cancellation. The carrier is not obliged to pay any compensation when the delay was caused by extraordinary circumstances which could not have been avoided even if all reasonable measures had been taken. Carriers sometimes sell more flight tickets than there are seats in the airplane. Based on experience, they know that not all passengers aboard the flight. However, if there are more passengers than the number of seats, then the carrier shall first call for volunteers to surrender their reservations. The carrier offers re-routing or reimbursement of the flight ticket. In case that no volunteers come forward, the carrier will select passengers to be excluded from transport and to be denied boarding. You are entitled for financial compensation, re-routing to alternative transport or reimbursement of the flight ticket price, or for care for the period of waiting time before alternative flight. You must have a valid flight ticket with a confirmed reservation on the flight which the carrier denied you to board. Furthermore, you have to check-in within time limits determined by the carrier. If the carrier has not designated the check-in time, you must check in at least 45 minutes before the scheduled departure time. You also must comply with other conditions of transport. The carrier will not have any obligations towards you in case that you will be rightfully excluded from transport. It can happen, for example, when the passenger does not have any valid travel documents, his/her health makes safe flight impossible, the passenger behaves inappropriately etc. The amount of financial compensation is the same as in case of flight cancellation. No. The passenger can choose between re-routing and reimbursement of the flight ticket. The carrier can provide refreshments and potential accommodation only to those passengers who choose re-routing. You have the right for such amount of compensation on which you agree with the carrier.